Which Crates for the Minivan? Okay, and now the big search for the perfect crates begins. I don’t know why… is it a dog people thing? But I love to buy crates. They are nothing exciting, really, so why are they so fun to buy and collect? I dunno. Oh well, a mystery, but it’s fun anyway. First, I need a fairly largish crate for Levi. Currently he lives in, I think, a 36?L x 24?W x 27?H. And it’s a bit too short for him. And with the Minivan only being 48? or so wide, I think I want to stick to a 21? wide crate for him… which I hope he’d be okay in, and I think he will, I have a friend who I think has one so I can try him out in there. I like the side by side SUV/Minivan crates, they are 42?L x 21?W x 30?H which would be good, made by Midwest. Then there are the rest of the dogs… usually I just travel with three dogs. Either Tatum, Chase and Levi, or Tatum, Chase and Muffit. Muffit is a lot smaller and can get by with a smaller crate, but Tatum and Chase are both about the same size, bigger than Muffit, so I’m not sure if I’m going to get a small crate for Muffit that I take out when I don’t need it, or get a bigger one that Chase/Tatum can fit in and just leave it there all the time. I’m leaning toward the latter. I would love to have crates with doors on both ends. The narrow one above has this, which is great. I have not found other crates (yet) with doors just on both ends, but there are the tri-door crates by midwest. I am concerned that the single door on the side might catch with another crate (it did in my Dad’s blazer a bit), so that might be something to think about. But I could get two of these, the 30?L x 21?W x 24?H size.. I have two this size already (one single door and one two door), so I guess maybe what I should do is get the big one for Levi, and then put my two other ones in there and see how they all fit. Then I can decide on the smaller ones. Hrm that’s a good idea. I just thought of that myself. 🙂 I was kinda hoping I could stack the two smaller crates on top of each other, but the van is only 40.5? high, so two won’t fit stacked unless I get Muffit a fairly small one, but then if I don’t take Muffit I’ll need the bigger crates anyway. 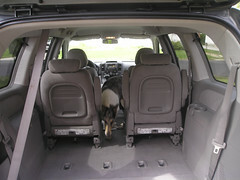 Previous Previous post: MiniVan for Me and the Dogs!